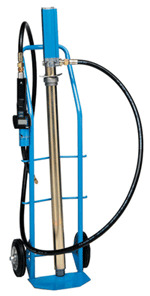 Complete unit includes 55:1 pump, drum cover, follower plate, 6 feet high pressure discharge hose, control handle, and Z-swivel. For the 16 gallon and 55 gallon units choose a system with or without a transport trolley. 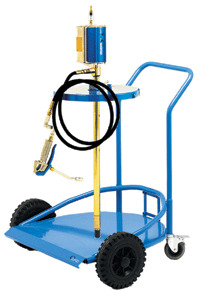 5 gallon unit has built-in carrying handle. Units operate on 145 psi max. 1/4" NPT female air inlet, 3/8" NPT grease outlet. All units are pre-lubricated, requiring no mist lubricators.